During “Dynamics Crunch Month” you can get the VIP Bundle for just $49. 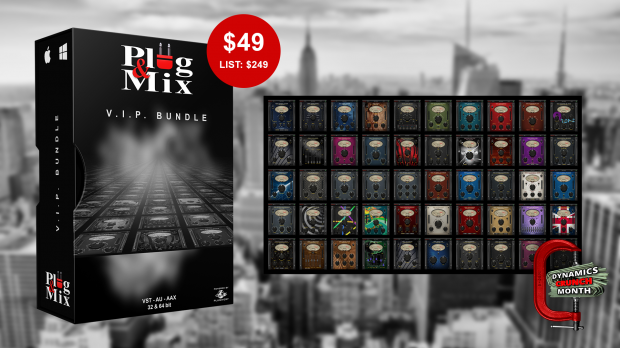 With 50 great sounding, easy to use plugs-ins included in the bundle that means you are getting them for less than One Dollar each! The Plug & Mix V.I.P. bundle is a collection of great sounding audio tools that were developed to have the most user friendly interface possible to allow to work as quickly as possible. Every possible effect you may need to finish off a superb mix is there in this very complete bundle. You are going to love working with us at Plug & Mix because we’re “user-friendly” towards you and your wallet. Once you have purchased or upgraded to V.I.P. Bundle status, all subsequent plug-ins released for the V.I.P. series will be FREE of charge for you! This entry was posted in DontCrack, Plug & Mix, Plug-ins, Promotions and tagged Plug & Mix, Plug and Mix, Retro, Retro Compressor, Retro Limiter, Ultramaxit, VIP Bundle. Bookmark the permalink.